Heat oil in large skillet on medium heat. Add scallops; cook 2 to 4 min. or until scallops are opaque, turning occasionally. Add pasta sauce; cook on medium-low heat 2 to 3 min. or until heated through, stirring occasionally. Remove from heat. Stir in lemon zest and pepper. 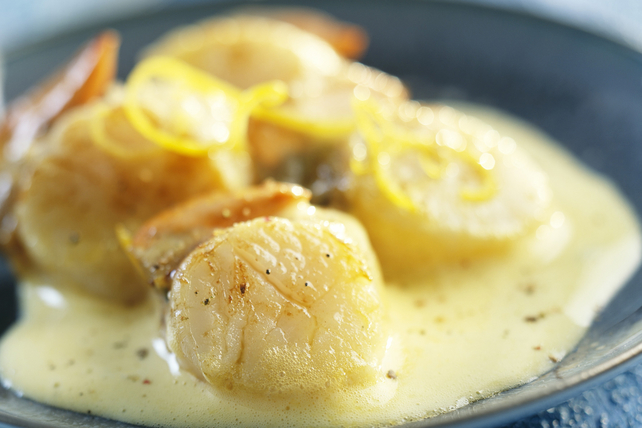 For best results, make sure that the scallops are patted dry (as directed in recipe) before cooking them. This will help ensure that the scallops are seared and not steamed.